The Winter 2014-2015 issue of Orlando Attractions Magazine is now available in print, on the Nook and in our iPhone and iPad apps. The cover story is all about Disney’s Frozen. Find out everything you need to know about experiencing “Frozen” at Walt Disney World and beyond: Meet the sisters, see the shows, sing the songs. You’ll also read a feature story on the new Pantopia area at Busch Gardens including the signature ride, Falcon’s Fury. Will you beat the facedown dropping fears? We’ll also take you to Sleuths Mystery Dinner Shows, present a Q&A with a former Disney Imagineer, find out about dining Italian style at Universal CityWalk’s Vivo, staying at Disney’s All-Star Resorts and staying warm on cold Orlando days with our Top 10. 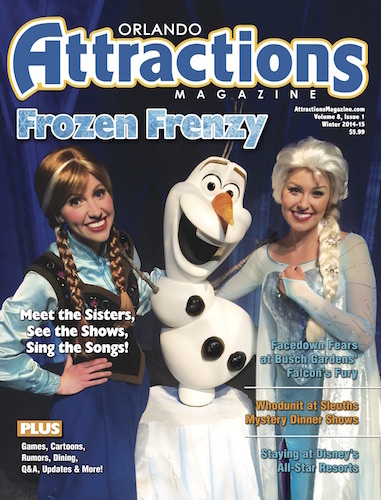 You can also find the latest issue at Theme Park Connection in Orlando, Fla. Print subscribers should receive their copy between now and January 20, 2015.